Should you throw something away once it’s gone out of date, or is doing so a waste of good food? 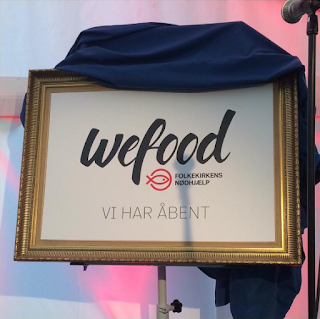 Wefood, which describes itself as ‘Denmark’s first-ever surplus food supermarket’, stands very much upon the latter ground. Its first store opened in Copenhagen’s Amager district earlier in 2016, and has since been a roaring success. 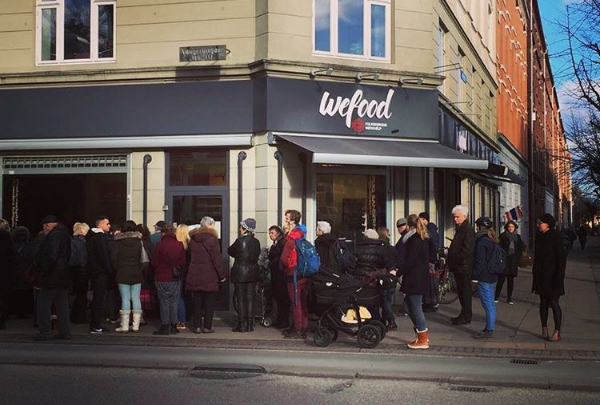 So, earlier this month, Wefood announced the opening of a second branch in Nørrebro district, described by the local tourist board as ‘one of Copenhagen’s hottest quarters’ (in terms of style, not temperature, we’d guess). But is such a project really that good an idea? Is it unsafe? Or does it promote a much-needed alternative to modern throw-away culture? Danish law is clear on the matter: you can sell out of date food so long as it’s clearly marked as such and isn’t obviously going to be harmful. There is, therefore, an element of subjectivity on the part of Wefood employees in adhering to the second part of the deal. Whilst you can’t eat the thing you’re going to sell to check that it’s alright, Bassel Hmeidan, leader of the Wefood project, told the Guardian that ‘we look, we smell, we feel the product and see if it’s still consumable.’ This is enough to allow consumers to buy the food at a discount of 30-50% market price. That’s very different to general practice in most supermarkets in Denmark and, indeed, most of the world, where gone-off food is thrown out before it’s passed the sell-by date. It’s partly for food safety purposes: making sure the threshold for sale is over-compensatory means the food is very likely to stay non-rotten and so forth. However, manufacturers are further incentivised by the profits which come from shorter sell-by dates; their customers (i.e. food retailers) need to throw out any produce that doesn’t sell in time, and buy some more to keep their stocks up with consumer demand. More waste, basically, entails more profit. So, is it unsafe to sell expired food? Short answer: probably not. For one, even the UN calls many sell-by dates largely ‘arbitrary’; and I’ve always thought the majority of best-before recommendations are really there for the benefit of those who spend their weekends ‘prepping’ in tin foil hats. Most students know first-hand that sell-by dates are more like guidelines than actual rules (except those on dairy or poultry products, which are indeed gospel). So, why are Wefood risking potential lawsuits by selling on such subjective grounds? It’s not only the fact that a throw-away culture is unsustainable: it’s also considered socially unjust. As it says on Wefood’s website, over one third of all the food produced in the world ends up in the trash. At the same time, nearly 800 million people all over the world go to bed hungry every night. Cutting food waste is good for the environment and, we’re led to believe, will benefit the hungry. But how much good are Wefood really capable of doing? Let’s look at the future of the project. Firstly, looking, feeling and smelling the food is all well and good when you trust the lookers, feelers and smellers; with dedicated, artisanal vendors at the helm, things are of course going smoothly now. But if things spread too far from Hmeidan himself, it’s questionable whether standards will not slip. Still, if lots of small copycats happen to surface in various localities, Hmeidan may just have ended up affecting positive change. One thing we can’t predict is whether the ultimate goal of social justice will be achieved. After all, whilst less food on the landfill may make us feel better when shopping at a store like Wefood, it won’t necessarily help the 800 million who are starving elsewhere. Beyond potentially inspiring other similar business start-ups, there are, crudely, four effects of Wefood: more cash in customer pockets; more cash in Wefood’s pockets (for charity); less food produced and wasted; and probably slightly more cash in supermarket pockets. To explain the latter two: if customers are buying from Wefood, they aren’t buying fresh products from supermarkets; meaning supermarkets are producing less overall and getting less business. However, they will still gain business overall, by getting a reputation for social responsibility. So it’s probably more profitable for supermarkets to play ball in the long-run (provided Wefood doesn’t get too big). Two questions, however, arise from that list of effects: what will be done with the extra food, and what will be done with the extra cash? The answer to the former is easy: there is no mechanism in place to redistribute the actual food to hungry people. Nobody will see it outside Denmark, and the hungry people will stay hungry. The answer to the second question is more difficult. Wefood gets all of its food free from supermarkets, its employees are volunteers, and all its profits go to charity. Still, there is no guarantee that any of the surplus cash in the pockets of supermarkets will be directed toward the hungry people. Even if we said, for argument’s sake, that it did: there would still be a myriad of issues surrounding how effective such altruism can actually be in practice. It probably wouldn’t hurt; but then again, some would argue it does. For example, it’s always seemed that if we want real international redistributive justice, it has to be led by collaborative states; not by NGOs doing their job (less effectively) for them. By leaning on NGOs, are we simply allowing structural problems to further embed themselves? That’s perhaps a debate for another day. Let’s for now simply ask: what can we expect from Wefood in the short term? Well, firstly, it isn’t going to do as much good as it wants you to believe. The redistribution of food is by no means catered for, and the redistribution of wealth is questionable; moreover, even if they were, they would not necessarily mean a fundamental fix to the problem. However, will Wefood make things better rather than worse? Most likely it will. Cutting food waste is a pretty basic step in an overall attitude-shift which it seems richer countries need to undergo if the end of social justice is to be achieved. However, we need to remember that it’s not nearly enough on its own: buying food products which have passed their sell-by dates is innovative, but it by no means tackles the roots of the modern world’s imbalanced international wealth distribution. Then again, if it were a choice between Wefood and Tesco, I’d shop Wefood every day of the week (not literally but…probably Saturday mornings).